This is easy to use, easy to apply and okay drying (about 5 minutes a coat). It's a nice pink colour with a silvery shimmer and flecks too. This is really nice. Lasted well. Wat a fabulous color, makes me happy! I like such shades and addition of flakes. That is indeed a lovely looking pink! This is one of the few BL polishes that behave nicely on me. :/ Looks pretty with your skin. 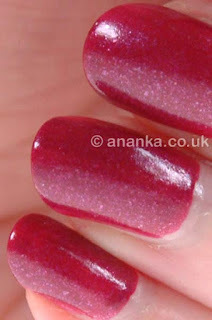 This is a pretty pink :) I like Butter London but sadly I only own one of their polishes. What a pretty pink, love the shimmer...I need more Butter London!